This 2-position multi-functional leash is inspired by the classic guide dog leash, and is a perfect choice for anyone who prefers a simple, versatile, yet no-nonsense leash. New, revised design with 3 different lengths to choose from! 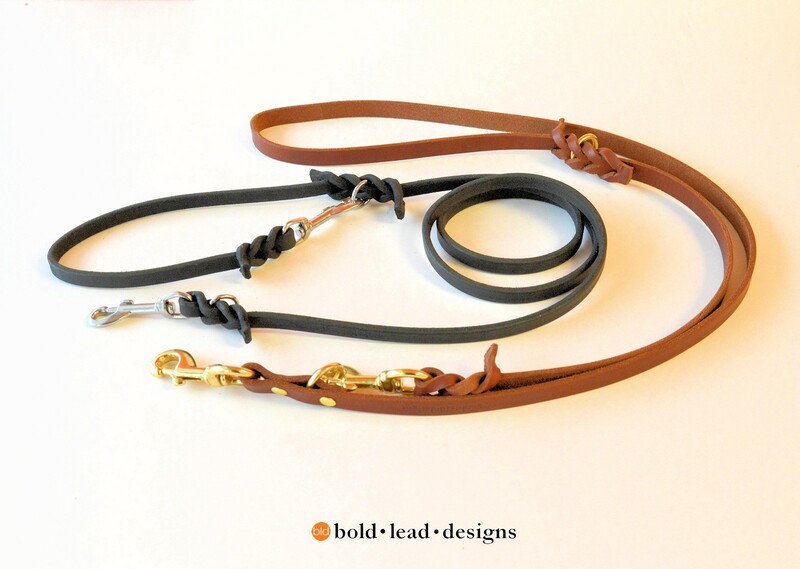 Bold Lead Designs’ two position Service/ Guide lead is available in three lengths to suit your needs. 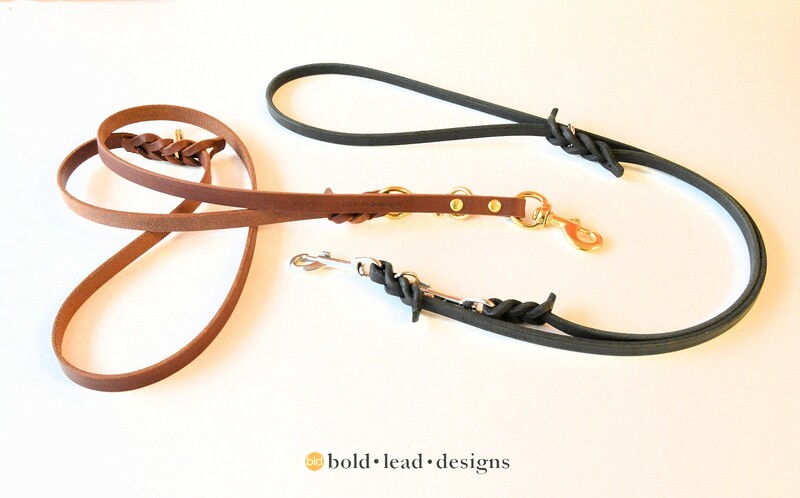 The simplified design makes this leash lightweight and easy to use. 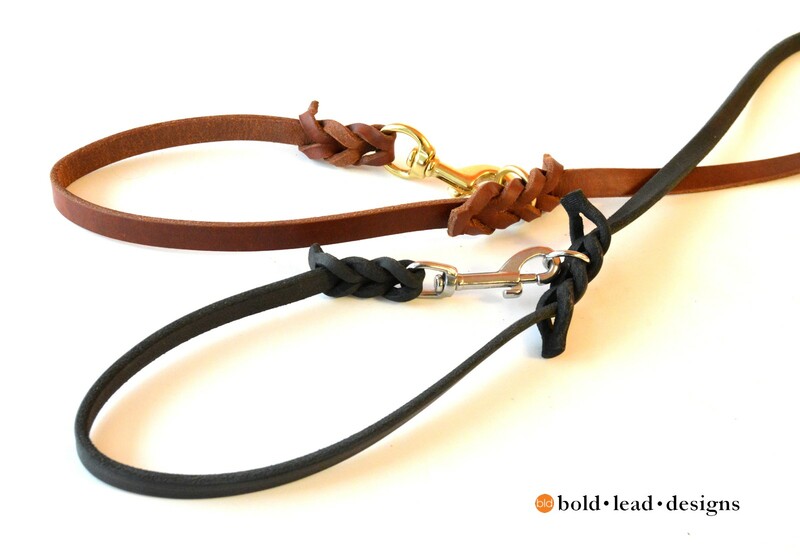 It has a clip on both ends and two fixed rings so you can use this leash in multiple ways. 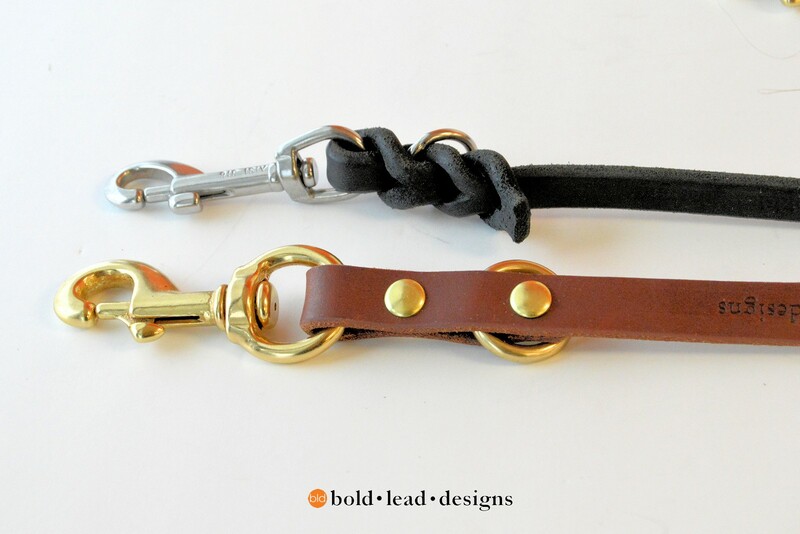 One ring is to fashion the handle portion of the lead, the second ring is at the “dog end” so the leash can be made shorter. We designed this leash for use with a dog in harness, but its convenient features make it a great every day leashfor training, therapy dogs, or everyday walks. The shortened position of this leash is just the right length for keeping the dog close, or for grasping the leash with a harness handle. The longer length is just right for leisurely walks, relaxing, or relieving. 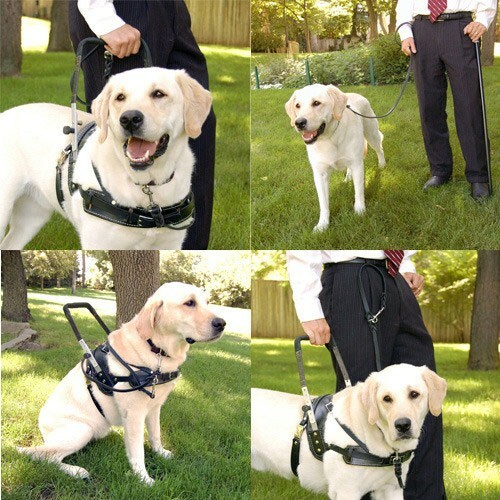 This versitile leash also can be used as a tie down by looping around a post. Our lovely BLACK LATIGO is solid black, and superior to ordinary leashes in texture and quality, cut from select from USA hides. It is incredibly durable, yet is very flexible. Feels great in your hands and will simply get better with age. Made with chrome plated solid brass hardware (some hardware is stainless steel depending on the size). Choose the length: This is the functional length of the leash when handle snap is clipped to ring. Standard bolt snaps are shown; they are the highest quality and most reliable snaps we’ve found. Special hardware or modification is available by request. I am in LOVE. I have been anxiously waiting the arrival of this leash and I am not disappointed in the slightest! I am a sighted individual though I have been immersed in the BVI community and their guide dogs since childhood. Therefore I have always had the opportunity to see how beneficial this style of leash can be, and have always wanted one for myself. After much hemming and hawing and shopping around I decided on this one. The personal feel, the options, and the surplus of information regarding the product ended up winning me over! Now that it is in my hands and on my Golden, I have no doubt that I made the right choice. I purchased a 5-ft leash with the wide width, and it feels STURDY. That is exactly what I have been looking for, the feeling that this leash will last as long as my dog. (Granted I take proper care of it and the other dog doesn’t get to it.) Even if it doesn’t, I will definitely be coming back as a repeat customer. Now I just need to go break it in, since it is real leather it is a little stiff and rough, but that won’t be a problem. I will tell all of my guide dog user friends, and even my non-bvi friends about this company! FB here I come! I love everything your company makes. People stop me all the time to ask me where I got my lead. My service dog and I will be customers forever. This was my first lead, looking forward to trying out the Working Dog Lead. The customer service matches the quality of the product and visa versa! Nicole was so helpful in selecting the right product & following up with me. Everyone comments on the ascetics and design of the leash. I have had other leashes but Bold leashes surpass them in ease of use. I have so many options with the 8-way lead, the service dog leash and I absolutely love the 50 foot leash. 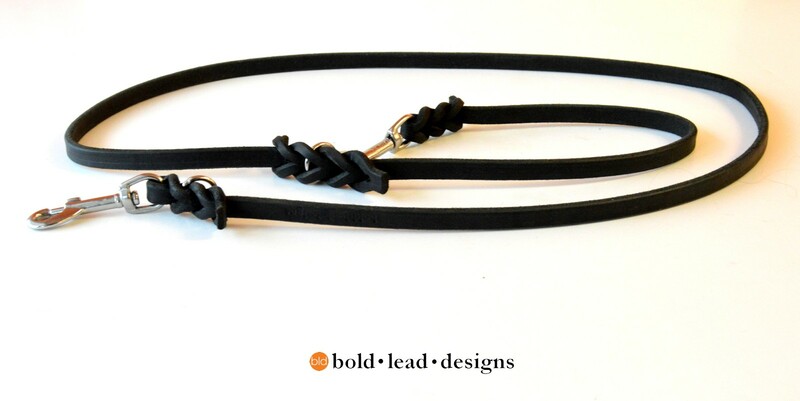 I recommend Bold Leash Designs to all of my contacts with dogs or service dogs. The leashes have even survived my service dog who loves to chew. I plan on buying two more leashes before christmas. My dog wears her harness every time we are out and this is a great leash. I use it so its at its shortest and it’s nice because you don’t have a lot of extra leash to hold. 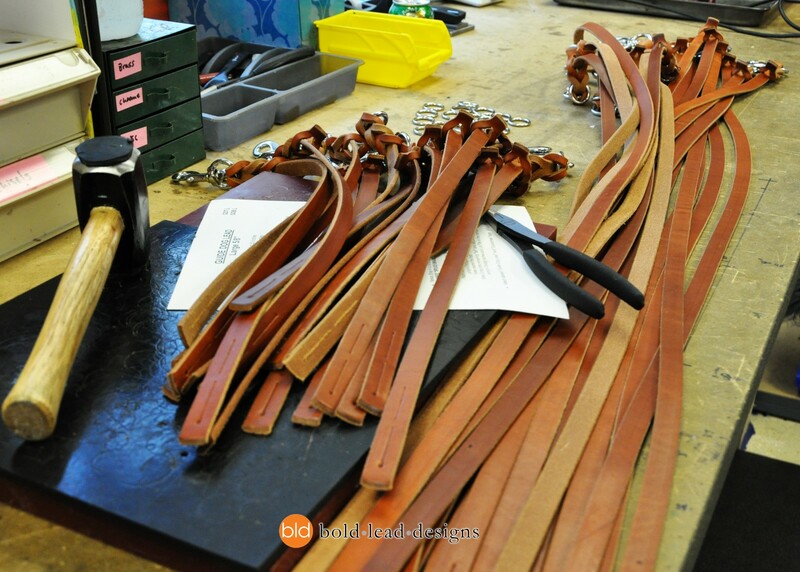 Leather and hardware are highest quality as well as the craftsmanship. Like everything from BLD the leather and craftsmanship are beautiful. This lead is just the right length for guide/service work. It’s perfect. Gorgeous leash, very comfortable on the hands and looks awesome. This is my go to lead when working my service dog in harness. The length is absolutely perfect (the guide length) for both working and general walking. I love the leather, even with my lead only being 1/2 inch it’s still plenty sturdy enough for walking unruly shepherd pups. I’ve used this lead for everything from dogs to less ‘approved’ things as hauling things up and down hills. No other leash will do for me! I love my guide dog lead. It’s a good length and very soft on the hands. It has broken in well. I brought this leash about two years ago and I use it every day still today. Great leash, perfect length, excellent quality. Will recommend. 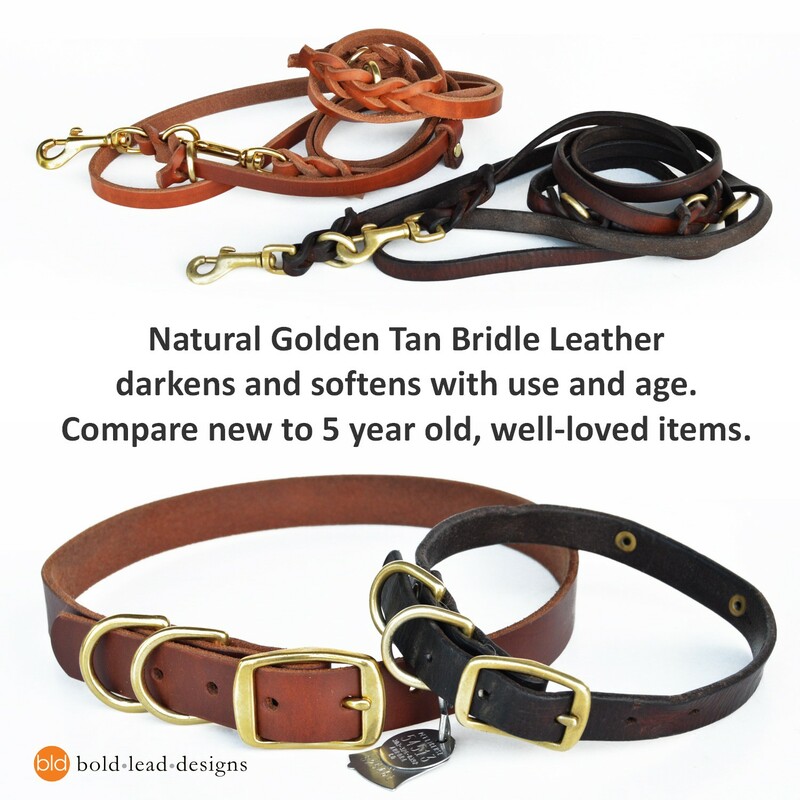 I am so happy that a reasonable priced leather works(collar, Leash etc.) in now available. I am training a bullmastiff for service dog work and The nylon leashes cut my hands. Say Hi to Smootchie the wonder dog. I love, love LOVE the service dog leash I recently purchased. It’s long enough for me to stand and put my dog in a down without having to take it off my shoulder. I also use it on the shortest position for extra control as she’s learning to run with my bicycle attachment. The leather is heavy and will soften up nicely and last for years, and the hardware is substantial. Glad I found your site!! 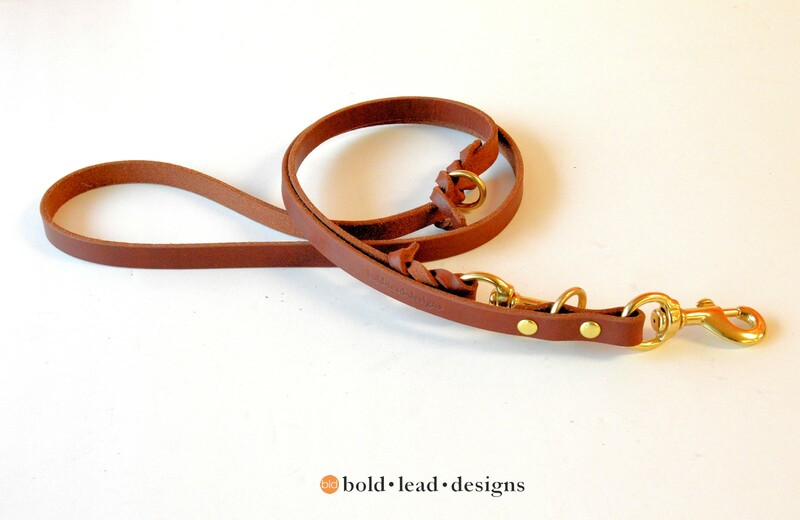 8-Way Lead™ – versatile leather leash (6 or 8 feet long) – Golden Tan Bridle Leather, Small 3/8″ / 7mm.